Investing in dividend stocks for income can be a sound retirement strategy, but as with all things in finance, there are some important specifics that investors need to be aware of. This guide will look at what income investors need to know about ex-dividend dates, as well as other key dates associated with when and how you get paid from dividend stocks. We'll also evaluate whether or not it is generally a good idea to try to time your purchase or sales around these dividend dates in a strategy called "dividend capture". There are three important dates to know when it comes to receiving a stock's dividend. Date of record: when a company announces a dividend payment, it sets a date of record when you are required to be on its books as a shareholder in order to receive the payment. Ex-dividend date: you must be a shareholder prior to a company's ex-dividend date to receive its declared dividend payment. If you buy on or after its ex-dividend date, the seller receives the dividend. Stock exchange rules determine the ex-dividend date, which is usually one business day before the date of record. Pay date: the day the dividend actually shows up in your brokerage account. Most companies are owned by millions of shareholders, ranging from large institutions such as BlackRock and Vanguard to individual shareholders who own relatively tiny positions. In order to service the back office needs associated with share ownership (including dividends, tax information, and proxy statements), companies create rosters or lists of shareholders based on the clearing data from brokers and clearing houses. Stock trades in the U.S. take three days to "clear" meaning that on the third day after you buy a stock the company officially lists you as one of its shareholders. This means that the date of record is always two days after the ex-dividend date including the day you buy the stock. The dividend pay date is usually a few weeks after the ex-dividend date and represents the time when the dividend is deposited into your brokerage account or you receive your shares via a dividend reinvestment plan. Simply put, in order to receive a dividend you need to buy the stock the day before the ex-dividend date or earlier. Let's use one of 3M's (MMM) dividend announcements as an example. For 3M to know you are one of its shareholders entitled to its latest dividend, you would need to buy the stock on May 16 or before. That would give the financial clearing houses time to settle the trade and place you on the company's roster of owners. On May 17, the ex-dividend date, the share price of 3M would (in theory) be adjusted down by $1.36 per share, representing the decreased value of the cash it just paid out to its shareholders as a dividend. There are two special exceptions when the ex-dividend date is actually deferred until the first business day after the dividend is paid (well after the record date). This occurs when the dividend is at least 25% of the stock's value, or if the dividend is paid in shares of stock rather than cash. However, it can be a tedious process to find the right dividend page for different companies. 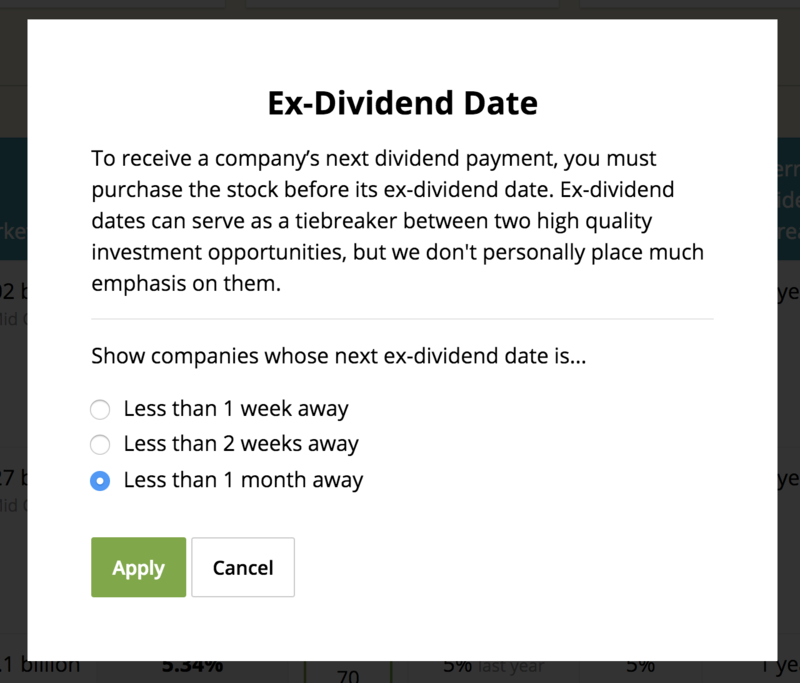 To make retrieval of ex-dividend dates easier, a number of financial websites (including ours) aggregate dividend date information across thousands of companies. You can retrieve any company's latest ex-dividend and pay dates on our website to know exactly when you need to own the stock to receive its next dividend. Our portfolio tracking tool also makes it easy to pull in ex-dividend dates for all of your holdings to help identify more timely income candidates. However, due to the mechanics of how dividend payments work, there are some important implications all investors need to understand that pertain to your long-term total returns, special dividends, and an investing strategy known as dividend capture. There is a somewhat popular strategy known as dividend capture, in which traders attempt to buy dividend stocks just before the ex-dividend date and then quickly sell at or soon after the ex-dividend date. The theory is that you can quickly "capture" the dividend and thus make a quick and relatively risk-free profit. For example, in our 3M example, if you were to buy 100 shares of the stock on May 16 and sell on May 17, then your account would be credited $136 on June 12 when the company's dividend is paid out. However, remember that there is no free lunch on Wall Street. 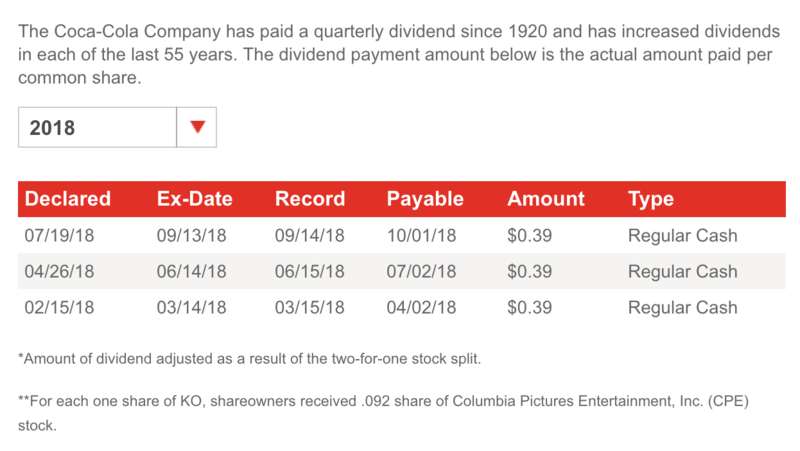 If you take a dollar out of a company to pay a dividend, then the firm's equity is worth a dollar less than it was valued immediately before the payment was made official. That's why on the ex-dividend date the share price typically drops by the dividend amount. This is also true for one-time special dividends, which can sometimes be extremely large (10% or more of a company's share price) and can happen after a company completes a major asset sale or has a large one-time windfall. Therefore, if you were to try to capture 3M's dividend via short-term trading, you are unlikely to actually benefit. 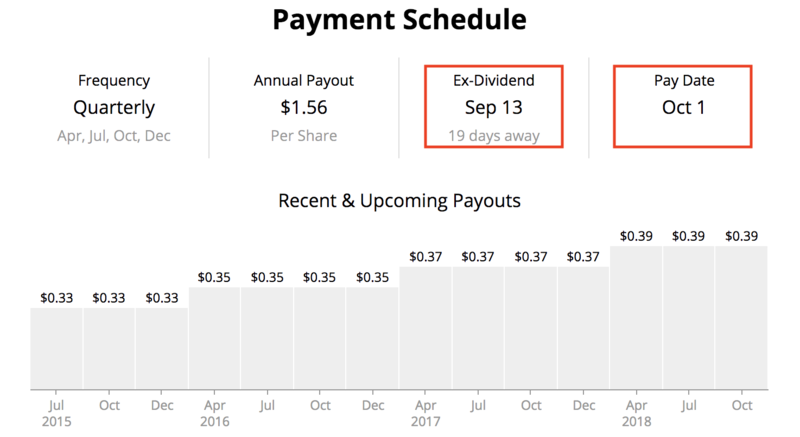 The $136 in dividends you received on June 12 would likely exactly match the $136 decrease in the value of your shares that took place on May 17, the ex-dividend date. Many dividend capture investors instead believe that a stock quickly recovers to the level it was trading at prior to the ex-dividend date. To capitalize on this belief, these investors use historical analysis of short-term trade movements called technical analysis. They usually try to devise models that tell them what stocks are hopefully going to recover on the ex-dividend date or within a few days after. For example, a dividend capture trader might conclude that based on the last 12 months of trading data, 3M usually rallies on and after its ex-dividend date, thus allowing for a quick 1% to 2% profit from the dividend. Dividend capture can seem extremely appealing in the case of special dividends, which some investors mistakenly think they can take advantage of to make a quick 10+% profit by capturing this payment. However, the same rule applies. On the ex-dividend date the share price should be reduced by the special dividend amount, meaning there is no benefit to investors. There are a number of other issues with the dividend capture strategy, too. For one thing, the investor incurs higher trading commissions and potentially short-term capital gains taxes which eat away at any gains. Furthermore, no one can consistently predict how a stock will trade on or after its ex-dividend date. Short-term stock price movements are influenced by many different dynamic factors that cannot be reliably forecasted. Perhaps the broader market begins selling off, or maybe a company-specific issue crops up to push the stock lower. No one knows. A dividend capture strategy is simple to execute and looks appealing in theory. However, as with most things in life, if it sounds too good to be true, it usually is. Given the broad appeal of dividend investing, if this strategy actually had merit, not only would many more investors be doing it, but almost certainly any profitable edge the strategy had would be competed away. In our opinion, any profits gained from dividend capture are purely due to short-term luck and have nothing to actually do with the dividend itself. Or to put it another way, dividend capture is just another term for short-term trading which studies show almost no investors can do profitably over the long term. Thus we recommend conservative income investors avoid the dividend capture strategy. The other important implication of ex-dividend dates is that unsustainably high dividends are not a good thing for long-term shareholders. That's because the company's share price gets reduced by the amount of the payout, meaning that it's essential that a dividend be sustainable otherwise the share price will actually fall over time. Suppose a company pays a $1 per share annual dividend but only generates $0.50 per year in earnings (a 200% payout ratio ). If the stock is trading at $10 per share, then after one year the price will have been reduced to $9 by ex-dividend date adjustments while the book value (a rough tracking measure of intrinsic value) of the company will have only increased by $0.50 (retained earnings per share) to $9.50. Over several years, assuming no growth in earnings, the stock will actually decline in value since the dividend is what's known as a "destructive return of capital". Book value is declining since the dividends paid out exceed earnings, and the stock price will track it lower. In contrast, if a company pays a $1 per share dividend out of $2 in annual earnings per share, then the $10 share price would be adjusted to $9 from ex-dividend dates, but the book value of the company would end the year at $11 per share ($9 + $2 earnings per share). Quality dividend growth stocks have rising earnings per share over time which is why they can grow their dividends in line with earnings and their share prices tend to rise. This allows you to enjoy capital gains as well as rising passive income. Not surprisingly, we focus on companies with sustainable and safe dividends and advise against chasing seemingly attractive but actually destructive "yield traps". While the timing dates associated with dividend stocks are important to understand, at the end of the day they don't change the fundamental strategy of long-term dividend growth investing. Investors should always focus on investing in quality companies that offer safe and steadily growing payouts, supported by: stable business models with solid cash flow generation, sound balance sheets, and good long-term opportunities for profitable growth. Ex-dividend dates can be viewed as a nice tiebreaker between two companies that meet that set of criteria and have similar valuations. Receiving a dividend sooner rather than later is nice, but it should not drive long-term investment decisions. Meanwhile, the dividend capture strategy may sound good in theory, but there is little evidence that it is anything other than just another short-term market timing strategy that isn't likely to make you money in the long term. Remember that the power of dividend investing, just as with stocks in general, comes from owning a piece of a productive asset that compounds in value over time, paying higher dividends along the way. While dividend growth stocks are a great way to build and preserve wealth over time, they can't help you "get rich quick". Don't let ex-dividend dates make income investing harder than it needs to be.